tl;dr — Declutter Your Mind has practical advice for those plagued with negative thoughts and are generally unhappy. Today, we will be talking about ‘Declutter your mind’ by S J Scott and Barrie Davenport. It came up in my kindle feed and the premise was interesting. If negative thoughts cloud your mind or you find yourself reliving painful past incidents in an endless loop but would like to get a grip of what you think of or to stop those replays, then this book will be a great help! The book suggests that by practising mindfulness, it is possible to declutter your mind, control the thoughts in our minds and live in the moment. First of all, why are thoughts so important? Our minds are constantly thinking of something or the other. Our thoughts give shape to our perception of reality. These thoughts can be positive, negative or neutral. The negative ones may have disruptive impact on us. Despite currently having everything that we need to have a happy life, we might still not be able to enjoy our lives if our mind is clouded with negative thoughts. Distractions such as food, drugs, work, etc may help for the time being but the negative thoughts come back again, and the vicious circle starts afresh. So, how do we solve this? How to break the loop, gain control over our mind and thoughts and how to appreciate what we currently have? The book describes this as ‘decluttering’ and this is explained from four perspectives — decluttering our thoughts, our life obligations, our relationships and our surroundings. The book devotes four sections to each of these perspectives. How does our mind get cluttered with so many thoughts, many of them of not much use to us? Mental clutter can be caused when we are stressed about something. It can be a result of having too many choices and not being able to decide which one to go with. Or it is the negativity bias — that our minds are hardwired to react more intensely to negative thoughts than to positive ones. The objective of this section is to help reduce anxiety caused by overthinking. What can we do to reduce this kind of clutter? The section provides a few strategies that can help — focussed deep breathing, meditation, replacing negative thoughts with positive or constructive thoughts. Focussed deep breathing, as the name suggests, is aimed at shifting our mind’s focus to our breathing pattern. This reminds me of one of my labour preparation classes — we were asked to practise focussed deep breathing while in labour in order to take our minds off the physical pain. Anyway, back to decluttering, the book recommends that we set aside about 5–10 minutes a day to practise. Focussed deep breathing also sets the stage for the next step which is meditation. If we feel, “nah, meditation is not for me”, an alternate way is suggested — which is to identify negative thoughts in non-judgmental manner and to detach ourselves from our thoughts. This can help in virtually sending the negative thoughts away (like to a bottomless pit), interrupting the flow of negative thoughts with a little physical activity (like for example gently popping the rubber band worn around the wrist) and keeping our mind engaged with something that needs focus and concentration. It could be as easy as going over multiplication tables in our minds. Other ways to deal with negative thoughts are to challenge the offending thought and replace it with something positive. We could accept the situation as is and try to improve it to our liking. Or, we could divert our attention into doing something constructive — draw something or make some craft activity, for example. When nothing works and the thoughts do keep coming back, all we can do it set a time for 5–10 minutes and once the time is up, stop worrying by distracting ourselves by doing something else. After decluttering thoughts, it is time to focus on our life obligations which is the second section of the book. In a week’s time, after taking away the time needed for personal hygiene and sleep, how much would we spend on each of these seven main areas of life is the question. A good way to do so is to identify our core values. But, what are core values and why are they important? Core values are our guiding principles in life. They play a vital role in our important choices or decisions in life such as who do we want to be with, how would we like to spend our money, etc. The book also provides an extensive list of values to choose from. Some examples are accomplishment, freedom, balance, clarity, self-reliance, kindness, etc. We could choose core values for personal as well as work life. Keeping our core values as the compass, we can set goals for ourselves and prioritise our activities to live these values. The ideal timeframe to achieve a goal is 3 months which is the optimum time frame, neither too long not too short a period of time. Once the goals are set, it is time to break them down into weekly task and take action to achieve those goals. A review of the goals will help evaluate if that’s what we really want and whether they align with core values. Clearly, our job or work is one of our life obligations and we do spend a significant portion of our day at work. So, if we feel no passion or love towards or job or work or if you want to live your passion, this sub-section of the book comes in handy. It gives a 14-step plan on how make a living out of our hobby or whatever it is that we love to do — right from clarifying the vision that we have, to taking action, to testing it and finally to stay motivated to keep at it. This chapter explains why relationships are important and why unhappy relationships lead to frustration and clutter our mind about continuations or arguments or our perception what the other person thought or meant to say in the past incidents. As human beings, relationships are central to our wellbeing and unhealthy relationships pave way to mental clutter. So, how do we foster healthy relationships with people who are important to us? Well, there are multiple ways of doing it — by being a good listener when they talk to us, by being mindful when we talk to them, by wishing them happiness and peace — like meditation. Relationships can also be improved once we stop comparing ourselves with others. This happens when we accept ourselves, appreciate what we have and change what we can, by keeping in mind our core values. Relationships suffer when we replay past incidents. The way out of the past is to move forward from the past. Every time we think of the painful memories, it makes us feel miserable in the present. With every replay, what sticks more and more in our mind is our version or our perspective of what happened making it increasingly difficult to look at the incident from the other person’s point of view. How can we break free of the replay sessions? The answer is two-fold: Look at the incident from another angle and to offer forgiveness. To look at the story from the other person’s perspective is to challenge our version of it and view it in a more objective manner. By doing so, it may turn out to have a much less negative impact on us. There might a valuable thing or two to learn once we look at the incident from the other person’s perspective. Offering forgiveness someone who we feel had caused us pain can be hard. More so, if that someone never apologized. Regardless, we could offer forgiveness in our mind to the other person. We could also forgive ourselves if we feel responsible for the past, at least partially. Forgiveness helps in making peace with past and hence easier to move forward to the present. Obviously, there is a portion which focusses exclusively on relationship with spouse or partner. For a happy and healthy relationship with the spouse or partner, it takes a commitment to be emotionally present in conversations. We could try to improve relationship with this commitment, whether or not the spouse or partner reciprocates such a commitment. Listening to him or her without being defensive, not to throw tantrums or involve in passive aggressive behaviour go a long way in establishing the relationship. Objective conflict resolution, without assigning blame helps in learning from the conflicts. Trouble with spouse having significant consequences such as separation are dealt with in a detailed fashion. The book also gives links to other materials such as blog posts of the authors, other articles and books which help understand toxicity in relationships and how to identify them. The last part of decluttering relationships is to let go of certain people. These people may have caused or may still cause pain and agony. They stand between us and our happiness. Letting go does not mean cutting all ties, but it could mean redrawing the boundaries in the relationship (with ex-partner for example) or cutting back on the frequency of the visits or interactions. Letting go can be trickier in case of close family like our parents or siblings or grown kids or in-laws. It would also mean that we need to deal with the consequences of how they react to this change, how others (parents for example if we are reducing the interactions with siblings) react to it and the guilt we may feel after saying goodbye. After the initial period of guilt and grief, letting go of toxic relationships would make us much less anxious. The final decluttering is about our surroundings. How our physical environment affects our mental wellbeing. We could look at simplification of our homes, digital devices, our activities and our distractions. Why should we simplify our home? Our minds feel calmer and relaxed in a place with minimal furniture and décor than in a place packed to capacity. And decluttering doesn’t mean to throw most of things away to follow the minimalistic approach. We could examine our possessions and choose to handle them in different ways. Some may be given away some for charity, we could sell some and what is not of immediate use could be stored for the future. Digital devices take up a lot of our time. The time spent on TV, laptops, tablets and phones (mindless zapping between channels or scrolling up and down with no purpose but to kill time) can be cut back and instead be put to use to do something else — working out, playing some sport, singing, etc. When it comes to activities, why pack the day with back to back meetings or workshops or classes? It is not necessary to be busy all the time. A careful look at our daily schedule of activities can help in filtering out the important ones and cancel or reschedule the less important ones. The same applies for kids’ activities too. Sports, music, art, workshops, playdates — the list is endless. Cut back on these extra activities and make time for being free. Distractions not only helps in procrastination but also causes loss of focus or momentum at work or other obligations. If we put all the time wasted by distractions, it could come to a whopping number of hours or days which could actually be put to use in pursuit of our hobbies. Also, when it comes to actions, why are we always in a hurry to finish one and then other? Instead, we could be mindful of what we are doing — it could be as simple as eating our meal or running on a treadmill. Being mindful makes us aware of ourselves and our surroundings. We would look at these activities as enjoyment or a privilege rather than as a task. Let’s take exercise for example. It makes us healthier and fitter. Do we look at it as, “wow, it is time to hit the gym and get healthy” or, “aaaah, is it gym time again?” Living in the present means to enjoy whatever we are doing at the moment. 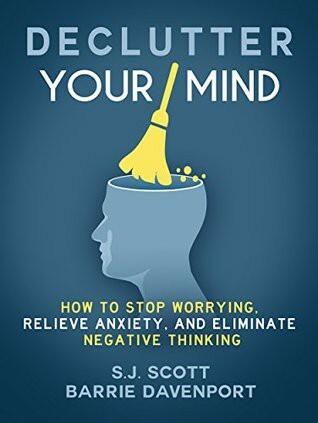 The book concludes with a gist of all the idea covered in various chapters and reiterates that with practice it is possible to control your thoughts as declutter your mind. This book is strongly recommended for anyone who is unhappy or annoyed or not cheerful, without knowing why. It is for people who seem to have everything they need to be happy but are not. The book lists down patterns or symptoms which are addressed in the book. It is not that this book can change our mindset overnight or we become cheerful and happy once we have finished the book. As the book suggests, with practise, it would become easier for us to identify the trigger of negative thoughts and control our thoughts rather than the thoughts controlling our minds. Thanks for reading. We welcome your comments and feedback. Until next time, bye! Click here to support Digital Amrit by buying Declutter Your Mind from Amazon.